Fit 4 Two founder Melanie Osmack had the pleasure of interviewing Camille Mehta, a Vancouver mom of four and recent TEDx Vancouver speaker. In your TEDx talk you share your personal journey with postpartum depression. Tell me about the moment you decided you wanted to share your story at a TEDx. It was actually a friend and TED alum who first asked me if I would consider doing a TED talk on the subject of maternal mental health. I first wanted to share the journey of my post-baby successes as an athlete (I’d taken up triathlon) and an artist. But then it became clear that the message I had that would really make a difference in people’s lives was a darker but more universal one. Descent into and climb out of postpartum depression. I was pretty nervous about opening up publicly, but now I am glad I did. How many women are affected by maternal mental health problems? This is a hard question to answer because when we count women who are affected by maternal mental health problems, we can only count the women who come forward. That is where the 13% - 20% comes from. But anecdotal evidence shows that the number is much, much higher. I’m certain that if every woman who experienced maternal mental health issues including depression, anxiety, OCD and PTSD came forward, the number would be at least 80%. In your TEDx talk, you said something that made my shout out “Heck ya!” even though I was home a alone. You talk about how maternal mental health is NOT a women’s problem. It is a society problem. Tell me more about this. I love your reaction! That is fabulous. Yes. People don’t want to think that pregnancy or new parenthood can bring on mental illness. The idea of a mentally ill mother is too terrifying. So it is shoved out of the public sphere and into the sphere of those experiencing it. Namely mothers. But the problem with this is two-fold. First, maternal mental illness doesn’t just affect mom. It can ravage a marriage and if it isn’t treated, it can have profound effects on the kids. Ask any grown up who was raised by a mentally ill mother and they will have stories. Maternal mental illnesses affect all societies and all walks of life. Second, I really do not think it is possible for someone to recover from mental illness fully without the help and compassion from their community. Mental illnesses like depression tell us all sorts of lies about ourselves and our relationships with others. Things like “I am not worthy of love”, “They would be better off without me”, “I am a monster”. Meaningful connections with those in our community such as family and friends and even strangers help to put this crazy inner dialogue into a more rational perspective. Maternal mental illnesses have a huge impact on society and can also be soothed by society. It is a well known fact that exercise is incredibly important for mental health. The benefits exponentialize when exercising as part of a community. When I reached out to you, you very candidly told me that you had always wanted to attend our Fit 4 Two classes but you just couldn’t. That made me really sad but it also made me realize that there must be something more we can do to help moms struggling with post partum depression and anxiety to come out to our classes….where they can meet other moms, get support, build their community….and of course benefit from the feel good hormones, endorphins, from exercise. How do you think we can do better? First, I want to say, “Thank You!” for everything including the opportunity for fitness WITH your baby and for the community building that you do. In my case, I had my kids so close together (four kids in five years) that it quickly went from ‘Fit 4 Two’ to fit for three, then four, then five. Lol. Often when a mom is struggling, even just getting out the door can be a challenge. And many women probably don’t know how positive an impact safe, inclusive, group fitness can have on their mental and emotional well being. I can really see a benefit in advertising with and partnering Fit 4 Two with hospitals, prenatal classes, Pacific Postpartum Support Society and Women’s hospital. I believe that accessing moms at a point of contact where they are already seeking help would save them the step of looking for your classes. It would also let them know that a Fit 4 Two class is not just about physical fitness, but is also about the benefit of connection, community and emotional support. You talk about how the rate of suicide goes up 70% from women the first year postpartum. That the leading cause of death in new mothers is suicide. This is hard information to hear never mind process. How do you think we can get this information out there? This is so important. I actually made sure that I found several studies that supported the fact that the leading cause of death in new mothers is suicide because it was so shocking. I was like, “Can this be true?!”. Sadly, it is the heartbreaking truth. The only way to get this information out there is to not hide from the truth. We have to keep talking to mothers, to fathers, to grandparents, to co-workers, to friends. As a society, we have to make sure that everyone knows that mental illness is a very real and very likely effect of pregnancy and new parenthood, that it does not diminish the beauty of this stage, that it is not something to be ashamed of and that it can be overcome. So much of the pain of mental illness comes from feelings of inadequacy and agonizing shame. An aware and supportive community may not be able to make maternal mental illnesses like postpartum depression go away completely, but it can take away the anguish of isolation and shame. This CAN save a life. You talk about reaching out and reaching in. Moms reaching out for help and allies reaching in to help. What are some things that allies can do to support a new mom who is struggling? First, is to recognise that every new parent is likely struggling to some degree and instead of asking if baby is a good sleeper (are they ever?) instead ask “How are YOU?” Once baby is born, mom or dad don’t get asked how THEY are very often. Invite them to share their authentic experience about parenting without jumping to offer advice or judgement. Next? Bring food! It doesn’t have to be cooked, it doesn’t have to be home made. It can even just be a couple grocery staples. This is especially helpful if there are other kids in the house. My favorites are milk, juice, fruit, cheese and crackers or bread. Even coffee cake. I always appreciated a healthy snack I could give myself or my kids. Some amazing friends brought delicious home made dinners and that was also so wonderful. Some of my friends and family would call me up while they were at the grocery store and ask if I needed anything. This was a life saver the night before school lunches or if I’d suddenly run out of milk or formula or diapers (!) and I’d not got a chance to go myself. I’d then just e-transfer them money for the bill. New parents also just sometimes need a little bit of time. If allies can gift a little of their own time it can make a world of difference. Offer to watch baby for a little while so mom can have a shower, pay bills, go for a walk or run to the store. Or offer to pick up older kids from school. And lastly, parenting can be lonely so be a friend. I loved it when a friend would come by, have a beer and just hang out. May 2nd is Maternal Mental Health Day. 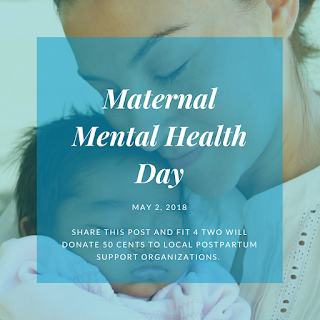 To raise awareness as well as funds for local postpartum support societies in BC and Manitoba, Fit 4 Two is donating 50 cents for each Facebook share and Instagram comment on May 2nd. Our goal (and budget) is to raise $1000. 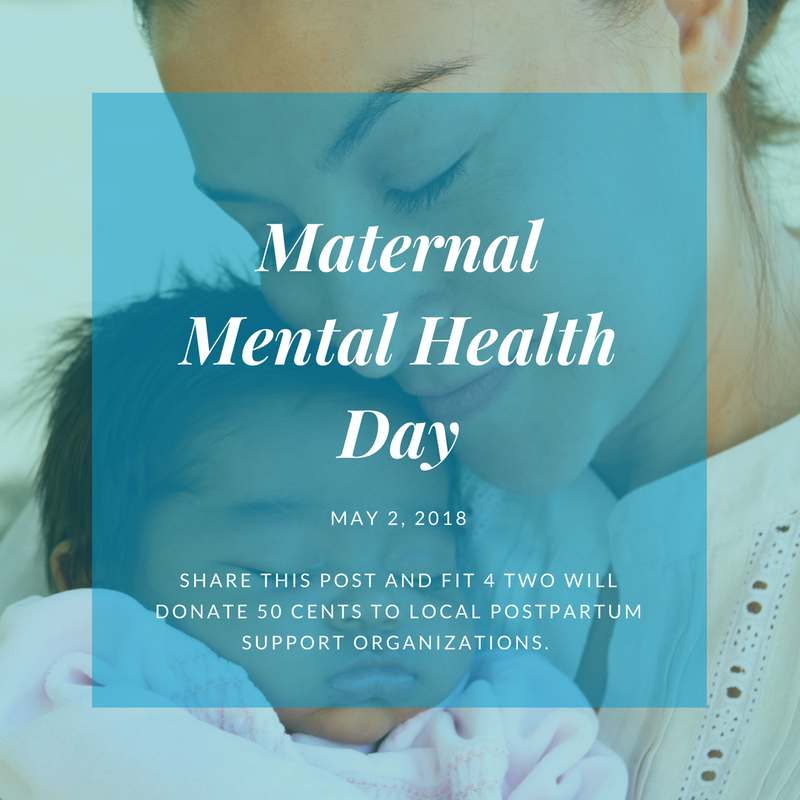 We are also asking people to donate directly to the Pacific Post Partum Support Society and the Post Partum Depression Association of Manitoba. Even though maternal mental health is a serious public health epidemic that effects everyone in society, organizations like these do not receive enough funding to serve the women who need them. They rely on donations from people like you. No doubt about it, many parents are intimidated by the idea of working out with more than one child. I remember my own experience easing back into fitness after my second babe. I was attending Stroller Fitness classes as a participant, pushing my Mountain Buggy Double packed to the gunwhales with snacks, diapers and a yoga mat. Fifteen minutes into my first class, I was sitting on the front nursing my youngest while passing Cheddar Bunnies to the other... a ton of work, indeed, and I wondered if I would manage to get any of the exercises in! But I stuck with it and I quickly learned to show up ahead of class to give my newborn a feeding on the park bench while my older daughter burned off a bit of energy at the playground, followed by a pit-stop & diaper change. At the beginning of class, I gave my eldest a Snack Trap full of granola and a sippy cup, while my youngest would soon doze off when we started moving. By the end of class, my eldest was happy to get out of the stroller to do her 'stretches' with the grown-ups and be a helper when I needed to attend to her little sister. It wasn't long before I was reaping both the physical and mental benefits that I so often preach as an instructor! Class Types? Stroller Fitness and Stroller Bootcamp are both safe options for attending with a mobile older sibling. Try it out first! Two schedules, two sets of needs... consider trying class as a drop-in first to see what works. Contact your local instructor to be sure that the class type you are attending allows drop-ins. Be prepared. The night before, pack your diaper bag and stroller so getting out in the morning will be that much more stream-lined. Make it special. One very successful mom used to bring special plaintain chips for her older daughter to munch on while she worked out, and she reserved this snack as 'Stroller Fitness Only' - her 2yr old quickly caught on! This also works with special toys or new library books. Make a day of it! Since it takes so much work to get out in the first place, plan to make the day an outing. Visit the playground or indoor play gym ahead of time to burn off the energy of an older sibling. Pack a nutritious lunch for afterwards and have a picnic! Involve Your Child. Keeping safety in mind, let your older child be part of your workout. Let him help count out your reps, or have fun naming the exercises that you're doing. During core & stretch, encourage your older child to get down on their own 'mat' (diaper change pad, blanket, etc) and do the exercises with you - as you can see below, it's never to early to be a positive role model for your child! Feel proud of yourself. You are making it work mom! Not only that but you are showing the first time moms that it doesn't have to be perfect. That it can be messy. And that's okay. You are an inspiration!